Title: 05/23/1991 - OSHA's Hazard Communication Standard as it applies to the janitorial service industry. This is in further response to your letter of March 22, to Secretary of Labor Lynn Martin, regarding the Occupational Safety and Health Administration's (OSHA) Hazard Communication Standard (HCS), 29 CFR 1910.1200, as it applies to the janitorial service industry, SIC 7349. The HCS was expanded to include all industries where employees are exposed to hazardous chemicals on August 24, 1987. It provides all exposed workers with the right-to-know information about the hazards of the chemicals they work with, as well as appropriate protective measures. In addition to having a right-to-know, exposed workers have a need to know this information. OSHA's rulemaking record indicates that the rule is both necessary and feasible in all industries where such exposures occur. As the HCS is a performance-oriented rule, employers in all types of establishments have the flexibility to adapt implementation of the requirements to address the specific needs of their workplaces. There are many types of businesses which have a large number of chemicals and do not have fixed worksite locations. The HCS has been successfully applied by employers to many different work environments. The literacy of the workforce in general is a problem, and is not limited to any specific type of industry. Workers' inability to access and effectively use written information requires more effort to be placed upon proper training. You indicated that you have no problem training people to do their tasks. This training should also include information about how to do those tasks safely, including how to protect themselves from hazardous chemicals. We believe that training under the HCS can be done effectively for workers with different kinds of educational backgrounds. The most important message to be conveyed during the training is that they are exposed to hazardous chemicals, and that proper protective measures are to be followed. They must also know where they can get more information, and to read and use labels and material safety data sheets (MSDS) when they can. Your comments regarding inclusion of other employers' chemicals in your program suggest there may be some misunderstanding regarding the requirements of the HCS. 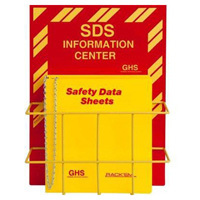 Training is generally done on categories of hazards, rather than on individual chemicals or specific MSDSs. Appropriate hazard warnings must be on the labels and MSDSs of hazardous chemicals and employers are to train their employees about those hazards. Once you have trained workers about all possible types of hazards covered by the rule, you do not have to re-train for a new chemical that poses one or more of those hazards (e.g., is designated as being flammable and capable of causing skin irritation). Workers should be trained not to use chemicals unless they have the necessary information to protect themselves. If they must work around another employer's chemicals, then you should inquire as to any particular protective measures that would be necessary, and provide them with the information and equipment that they need. You need not have direct supplier control of the chemicals in order to provide protection for your workers. While industry characteristics such as employee turnover may make compliance more difficult, they do not negate the need and responsibility to properly inform workers. As you mention in your letter, you are already in substantial compliance with most of the requirements of the rule. We hope this further clarification will assist you in ensuring that your program is properly implemented. We appreciate your interest in this important issue.